From scheduling doctors’ appointments to monitoring ongoing health care concerns, not having a flexible job can impede someone from being able to prioritize their health and being able to work, too. Our 1 Million for Work Flexibility community showcases how work flex means not having to choose between caring for your health or keeping your job. Work flex means a healthier work-life balance. You might be hard-pressed to find a worker who finds the workplace relaxing. But some in-office jobs have much higher stress levels than others. And if you’re already suffering from health issues, that extra stress can exacerbate your pre-existing medical condition—and possibly make it worse. You don’t have to announce your illness. Some healthcare issues are the ones that no one sees, but that you silently deal with on a daily basis. When you have a mental health issue, you might find working in the office too challenging to tackle—but not necessarily want to tell your boss what you’re really going through, either. Flexible work means that you can take time off to care for yourself without running the risk of being labeled, being judged, or even losing your job. You can recover without pressure. If you’ve had a procedure done, the pressure of having to get right back into the office can be overwhelming—and possible impede your recovery. Having a telecommuting job (or an in-office job that allows you the flexility to juggle your hours and work remotely sometimes) can greatly improve your chances of having a full recovery—and still stay on top of your workload. Flex can help you stay healthy. Who hasn’t had a job where someone came into the office sniffling, and by the end of the week, everyone was sneezing and sick? From keyboards to coffee machines, the office is one giant cootie catcher, and chances are you’re bound to get sick at some point. But if you’re already immunocompromised, the workplace can truly be toxic. 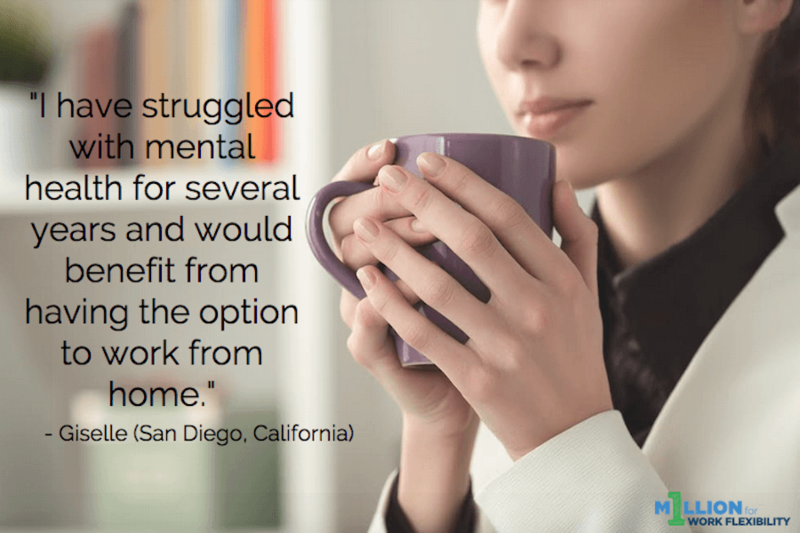 Working from home ensures that you’ll stay healthier—and most likely, happier. Work flexibility can aid in preventing health issues before they happen. In addition to reduced stress from not having a commute, a flexible schedule means that you can take care of your work commitments and still make time in your schedule for exercise and well visits. It also means being able to eat better foods instead of hitting up the vending machine for that stale candy bar. Readers, how has work flexibility been a benefit to your health needs? Let us know by joining the movement and chiming in with your reasons why you’re pro-flex.